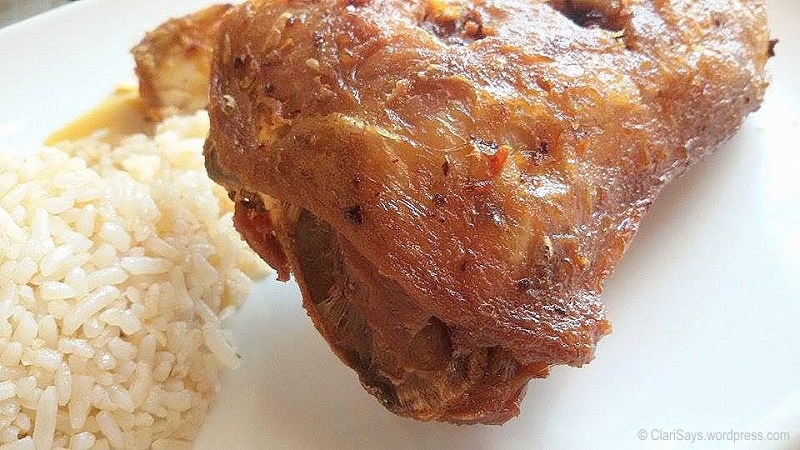 Filipinos love Bagnet, the Lechon Kawali of Vigan, Ilocos Sur. And why wouldn’t we? Ilocos Sur’s Bagnet is pork belly boiled until tender and deep-fried until crispy and brown. Once you taste it, you’ll never forget it. Are you starting to crave for Bagnet? Well, you don’t have to travel far because it’s within easy reach. Meanwhile, the newly-opened Stoops Bagnet Ilocos is located at 53-1A AL3 Building Visayas Avenue Barangay Vasra Quezon City. If you’re not familiar with the area, I suggest looking for the Shell Gas Station along Visayas Avenue because across that is the AL3 Building. Once you see a vibrant orange façade, then you found Stoops! Once you enter Stoops, you might say it’s a pretty small place. Yes, it’s small but the tables and chairs near the entrance to the counter are neatly aligned. However, the two tables near the counter and kitchen needs to be rearranged. I think it would be best to remove one table. Or, keep both but maybe make the second table perfect for two guests only to give more space. Despite that certain area, I still find Stoops Bagnet Ilocos Visayas Avenue branch a nice place to dine in because of neatness and cleanliness. I have been there twice. As always, there are many people eating lunch and dinner at Stoops. Again, why wouldn’t they? One, food is affordable. Two, food is delicious. You get what you pay for! The first time we visited Stoops, I remember it was raining hard (‘coz I kept staring at the raindrops on the window glass) and we all had the Bagnet Meal Reg 105 | Spicy 110. My grandmother and I chose Bagnet Meal with Garlic Rice & Kamatis, Bagoong and Lasuna (KBL) side dish while my ninong opted for the spicy Bagnet Meal. The Bagnet was both tender and crispy while the side dish was the perfect companion. For dessert, the owner suggested we try their Banana Crunch with Vanilla Ice Cream or Dan & Eric’s Grand Ice Cream. I love Dan & Eric’s Grand Ice Cream. That’s the only ice cream we buy ever since we discovered it. But since it’s already cold outside, I opted for the warm Banana Crunch with Vanilla Ice Cream. It’s definitely a dessert people will love. Then on our second visit at Stoops, we decided to try different meals except for my grandmother. She had Bagnet again but with TBA side dish. I honestly haven’t heard of Chicken Bagnet. So when my ninong ordered this one, I asked for a small portion. It was deliciously spicy. It reminded me of Max’s Chicken but a bit different. I just can’t put my finger on it. Or it must be due to the spiciness. Obviously, this meal is mine. 🙂 I skipped breakfast that day so I decided to try their Longsilog. I must say, I was absolutely satisfied with my meal. When I come back, I might order their Bagnet meal or this one again. Of course, after a wonderful meal comes dessert. It’s Banana Crunch with Vanilla Ice Cream time once again. I’m not sure if the name “Banana Crunch” is super catchy or I just can’t hide the fact that I like it so much. Some of the diners were looking at me while eating it. I wasn’t offended, well I almost did. Then I heard them order Banana Crunch with Vanilla Ice Cream as well. So I just told myself, nainggit sila! They want to try it too! 🙂 Dessert envy! Visit Stoops Bagnet Ilocos now! They are open daily. Their Facebook page is Stoops Bagnet Ilocos Visayas Ave. QC. For deliveries, please call (02) 404-2341 or 0916 413-5800. Please note limited area delivery and delivery charge is P30.00. No minimum purchase.